Why would I pay for a Sling & Carrier Consultant? While the main difference in the experience you could have to learn about babywearing from a sling meet comparatively to a consultant does boil down to just “time and price” as I mentioned, it is a bit of an oversimplification again, so why would you pay for a consultant? Starting with the two points I have already briefly discussed, time and attention. With a paid consultancy service, I believe a large part of what you are actually paying for is the tailored or specialised information they are able to deliver to you. Whether it be in a one on one consultation or a small workshop setting, the ability to focusing on delivering what is most important to the specific audience means we are able to together reach a deeper level of understanding or learning. Also obviously, as part of the cost of any business, the resources involved play a part in the cost they are charging to you. As I have mentioned previously, the babywearing dolls are a bit of a hot commodity in the among educator groups alone. Clearly all of us will have at least a moderate stash or library (it’s a lovely perk of the job!) to teach, demo and/or wear! Most of us have started out in this line of work as first and foremost, enthusiasts of slings and carriers, so some of has have quite decent collections built up. Another perk is being connected to circles where people import, make or sell various wraps, slings or carriers so many consultants are able to dig up a “demo/test box” if you give them a bit of time. The other thing that I really noticed was a difference in my process of supporting and helping people after doing the Slingababy consultant training as opposed to before I had completed it, was the level of thought and attention I am paying to the process of demonstrating and teaching. 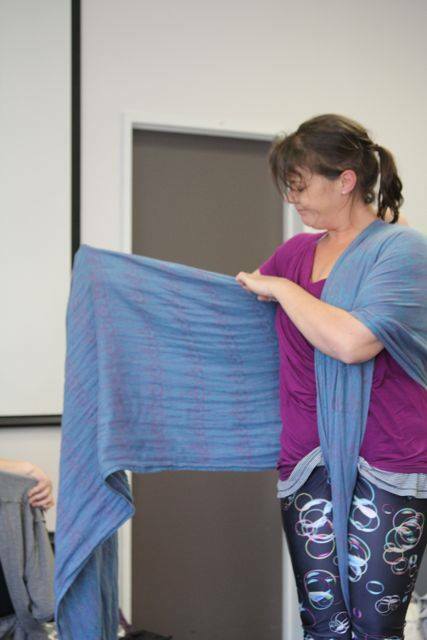 Take for example the ring sling, something I have used quite extensively for years now and still have a different take and appreciation for post training. The way I would use it, differs only very little to the way I might now demonstrate or teach it. Essentially the process isn’t all that different, but my emphasis, words and method have all altered just so slightly. Little tips and tricks from the course specifically, like “the price is right” move and being more clear and concise about the words I am using as I demonstrate are obviously great tools. More than that though, I think the thing I appreciated most about the Slingababy training in particular, was the emphasis of Lorette that this was just the beginning of our learning and training. Being more equipped and empowered to understand the pedagogical and andragogic aspects of the subject matter is a great basis for helping others. It provides us the opportunity to reach a deeper level of understanding and learning with our clients. But it is an ongoing process of learning, training, upskilling, experience and work, which is what it is for us as consultants, a job and a business for many of us, as well as a passion.